Become a sneaky cat in Catlateral Damage's Cat Ops mode or knock over all of the items at your own leisure. Catlateral Damage's Alpha charmed many cat lovers by giving them the opportunity to get a taste of what cats love so much about knocking over everything. For the upcoming commercial release, developer Chris Chung will include additional levels and modes, including a chance to be a sneaky cat or to destroy everything at your leisure. Speaking with Eurogamer, Chung explained how a "Cat Ops" mode would work. 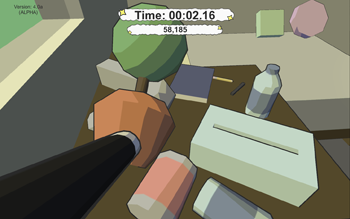 In the alpha available to play right now, players jump with their feline reflexes and swat as many items over as possible. At night, cats have to be quieter for fear of their owners running out of bed to see what made such a ruckus. "The basic premise is that it's night time and your owner is asleep, so you have to knock over objects without making too much noise," Chung said. "I feel like this mode will fulfill the desire to be a sneaky cat, and also give quite a different challenge than the current game mode." Chung also recently implemented a "timeless 'free' mode" that will be available in the next build. Players can swat to their hearts' content, leaving a path of wreckage behind their paws. Chung has not begun a potential time trials mode, but he noted it would be easy to add. He suggested it would "consist of a goal score, and you would try to achieve that score in the shortest time." Stages' sizes will grow in scope from individual rooms to a whole house. "I plan on creating entire houses broken up into individual rooms, so it'll be possible to block off rooms as separate levels or give the player full access to the whole house," Chung said. Catlateral Damage will launch this year on PC, Mac, and Linux. The browser-based prototype is available to play on the Catlateral Damage website, and the game is up on Steam Greenlight..